Shameless plug time. We know this isn’t typical blog fodder, but we’re incredibly excited about our upcoming day-and-a-half Studio Intensive this fall in Hartford, CT. We’re eager to share what is sure to be an amazing experience with healthcare executives and rising healthcare executives. Gone are the days when news releases and press conferences were central tools for headlines. Today, leading brands are building their own media functions, capable of engaging target audiences across an ever-growing span of traditional and digital communications channels. For healthcare systems who want to establish brand leadership, brand journalism is a critical core competency. 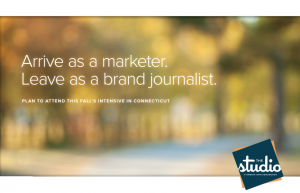 This Intensive will immerse members in a brand journalist environment for a hands-on learning experience. So what can you expect to learn and discuss? Interested? On the fence? We would love to tell you all about it! For more details, pricing information and to reserve your spot, contact Amanda at 757.692.5328 or amanda@corriganconsulting.com.